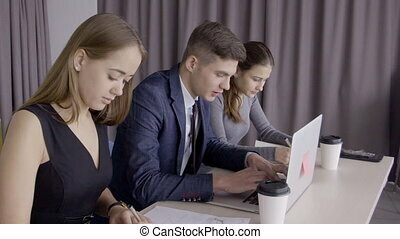 Three Employees In The Office To Brainstorm On The Business Project. 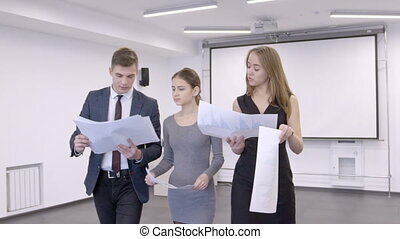 Three employees in the office to brainstorm on the business project. 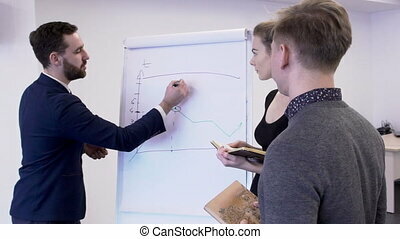 People discuss a plan of action to promote the product. 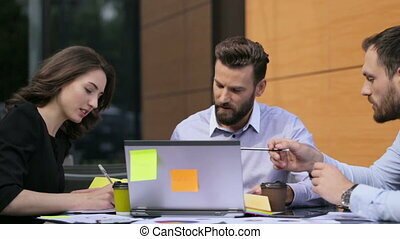 Man in black jacket and takes a piece of writing their proposals. 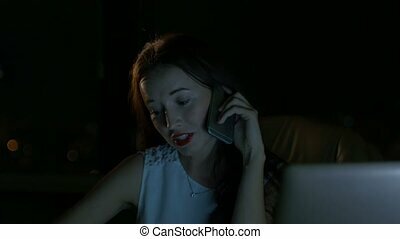 Blonde woman draws a circuit and sends it the brunette with glasses. 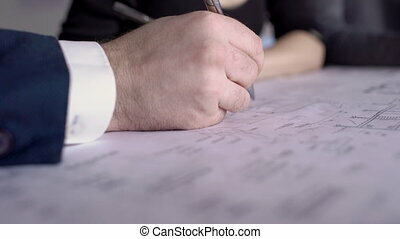 On the table are covered with cups of tea and a white plate and a variety of documents. natural light through a large window. For employees hang curtains design of the ropes. On the couch piled clothing and bags partners. 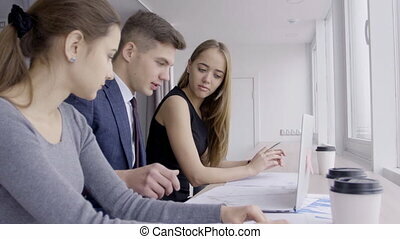 Three attractive young business people in the office working. Two women solving a problem. Serious business team working in the office. In the office at the desk three members make up plan for the project. 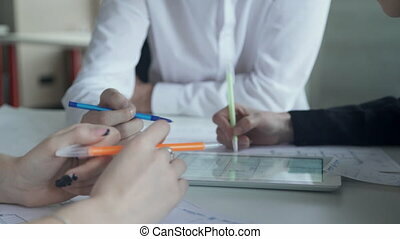 Each employee holding a pencil with which they form recording paper, which lie in front of them. 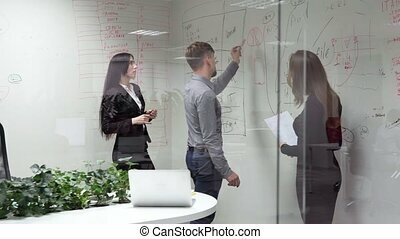 Two women and a man in a business shirt to brainstorm solutions to the problem. On the table is a white tablet, sealed cups with coffee, different documents. Before the boss is a notebook on a spring. The room is bright and comfortable. 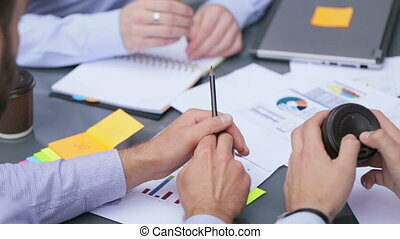 Employees with pens in their hands to discuss the plan on the tablet. 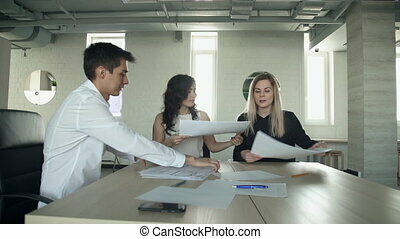 Brainstorming in an office conducted three staff members to resolve questions about the layout of the building. 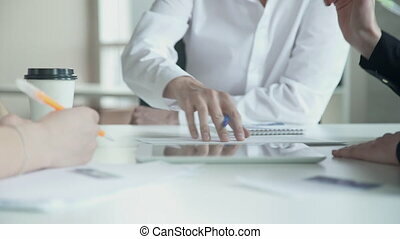 The project manager dressed in a white shirt. 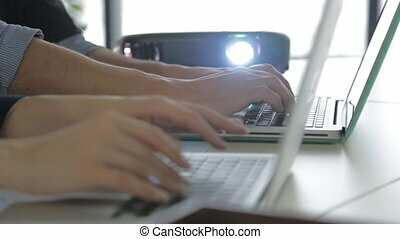 Workers actively turns shown on the computer screen. On a white lie desktop business paper with drawings. 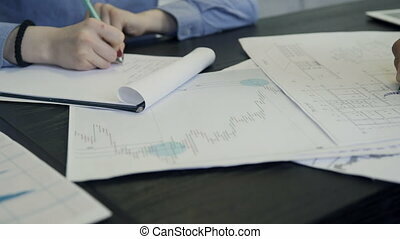 According to the documents, architects and engineers have reconciled with the building scheme. On the fingers of female professionals in the ring and decorated stylish manicure. The man joins the table to a meeting of employees in the office. 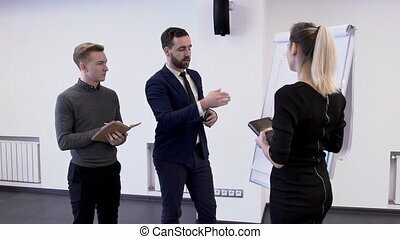 The young worker was late for the discussion of new questions. 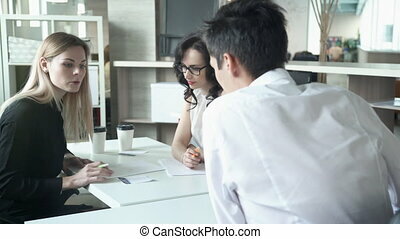 The head in a white shirt sits down to the women who started discussing the project on the documents. A beautiful lady in glasses with a pen points to the details of the object, to which you must pay any attention. A blonde in a black suit looks thoughtfully at the papers. In the office three staff smile and collect documents after use. 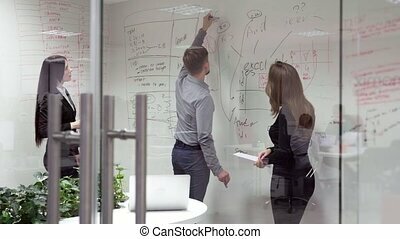 Two beautiful women and a man sitting at a light wooden desk, which laid paper with drawings and diagrams, pen and telephone. Workers finished work on an important business project and enjoyed a successful conclusion of the case. Employees satisfied with the result of its activities. In the background the high narrow windows through which natural light. 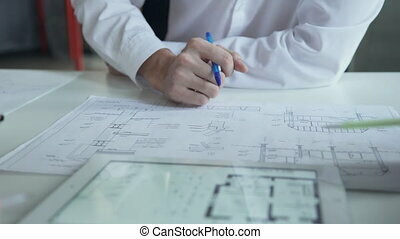 Two architects are correcting the blueprint in the office, close up. 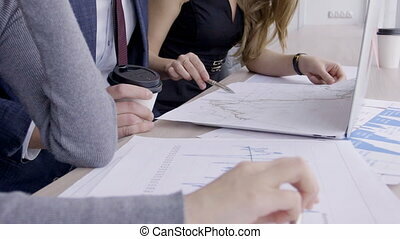 Female and male professionals are working together on the building scheme wich is lying on the table. 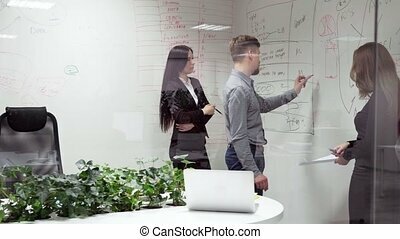 Woman and man are using ballpens to make some points in the project. 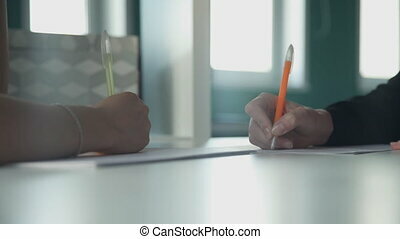 Two people at the table to quickly write pen on paper in the daytime. Orange pencil human being on the desktop takes notes in a notebook. On the one hand wearing thin bracelet. 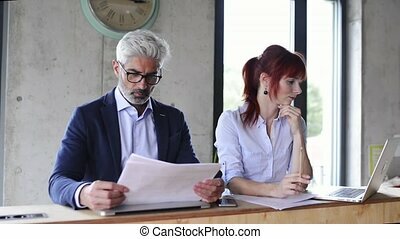 In a spacious office on the staff of a large company meeting record orders they receive from their supervisor. Through the large windows penetrates the light of day. A lot of orders that need to implement to achieve success and career advancement in the workplace. 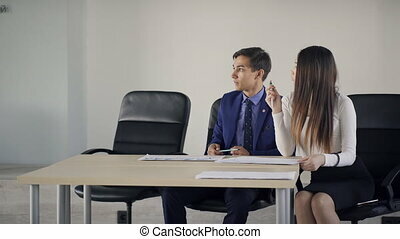 Business man is talking to colleague sitting in office. 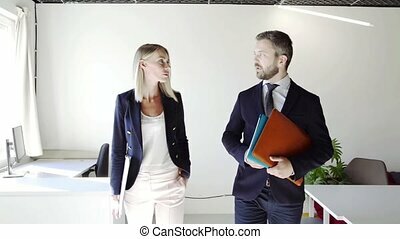 Young and handsome male is asking co-working woman about documents or work plan pointing important events for profitable work. He turned back for better conversation and discussing issues necessary for making right decision. He is wearing grey suit represented by classic jacket with golden decoration on lapel and sky blue shirt. 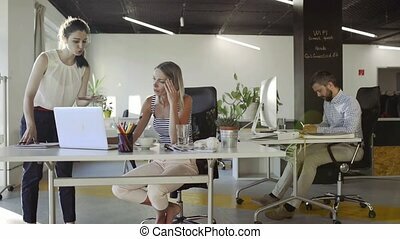 On background co-working woman is sitting at desk consulting document. 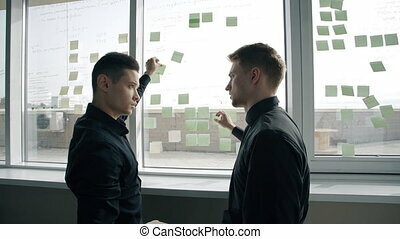 Two businessman glueing sticker to the window in modern office. 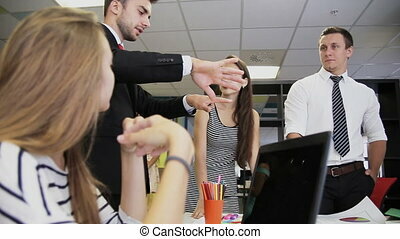 Concept: Concept of: business people, office interior, project management, team work, open space. 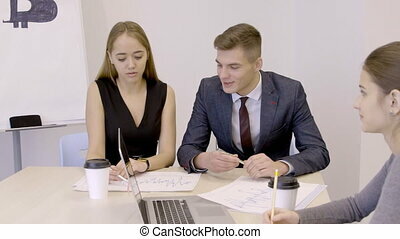 Two collegaues are working together on the project in the office: man in suit making notes and woman with red hair talking to him. Indoors. 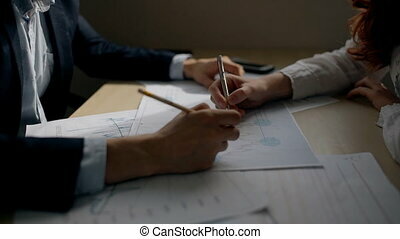 Hands of businessman and businesswoman working on financial graph in the office with ballpens. Close up. Indoors.